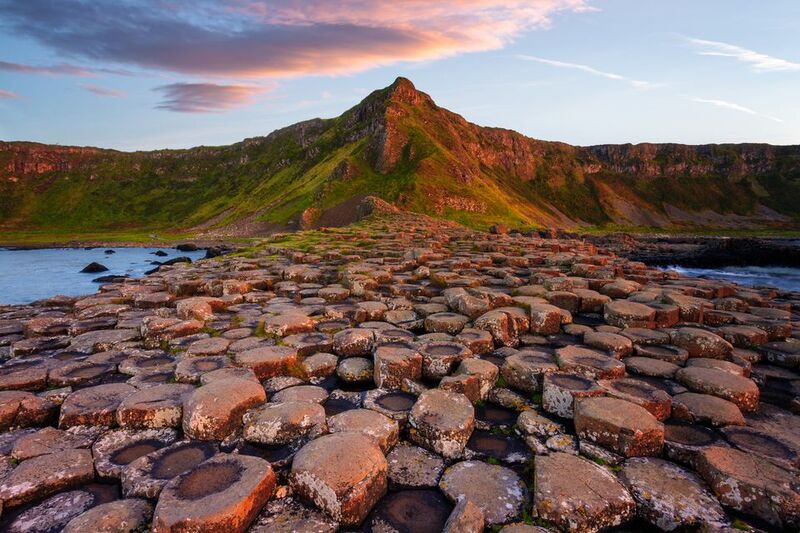 Stretching northwards into the sea from the Antrim coast, the regular basalt columns of the Giant's Causeway seem almost man-made. That's why their creation was attributed to legendary giant Finn McCool, wanting to cross over to Scotland. But the Giant's Causeway is all natural. And certainly a wonder. It also featured on the cover of Led Zeppelin's album "Houses of the Holy", so rock fans might like to hang out here too. Imagine driving up a steep hillside... and suddenly facing a sheer drop of a few hundred feet down into the ocean. Not an uncommon occurrence in the Irish west. But the steepest drop of them all is in Donegal. The cliffs of Slieve League tower feet above the Atlantic. Watch your step! These towering cliffs are, by the way, dwarfing the Cliffs of Moher ... and access is free to boot. Bleak, bleak, bleak ... the Burren is certainly not easy ​on the eye. Its gray limestone plateau is scarred by ages of rain and constant erosion. Less dusty than the moon, mainly due to lots of wind, but called a lunar landscape nonetheless. And strangely compelling - even though there seems nothing to be worth looking at first, you can’t look away. Both the mighty Shannon and the great Erne have their humble origins in County Cavan, but soon proceed to run radically different courses. Not only as rivers, but also as loughs (lakes). And both are a paradise for anglers, boaters, bird-watchers, and all other outdoorsy folks. Note that the shores may not always be as accessible as one would like - private ownership is often a problem in this regard. These celestial wonders never cease to amaze. Rainbows are often seen and of extraordinary brightness, though the proverbial pot of gold still eludes us. And the sky at night (outside the urban areas, naturally) is often so clear that you seem to fall into it. If you want to delve into the history of stargazing, and maybe partake in one of the special events, ​Birr Castle in County Offaly ​might be for you - here the "Leviathan", once the world's biggest telescope, still shows commanding presence. You think "Jaws" was scary? Try meeting a basking shark in Irish waters! Fortunately, these giants are quite gentle, feeding on small fry only and not at all dangerous to humans. Unless the latter die of a heart attack while snorkeling across the big beast's peaceful path. On a curious note: the seminal movie "Man of Aran" shows island folk hunting for those sharks... a tradition that had already died out at the time the hunt was staged. Basking sharks are hard to spot, but you may try the Cliffs of Moher or Slieve League as a good vantage point. The Natural History Museum in Dublin has a preserved basking shark on display. Ireland's boglands are numerous and vast but often exploited on an industrial scale. Which has its own charm, if you like bleakness. Maybe best for visitors is the Bog of Allen in County Kildare, one of the easiest to find and quite spectacular, with endless flatlands suddenly interrupted by hills breaking through the monotonous bogland.